It is important for research to have attention about the knife handles, from 2004 we know that the company did produce innovative products and design. I have looked over many handles and how they are attached, on 65mm, 85mm Classic, 85mm Evolution and Grip. Also 130mm Rangers with Evolution and Grip. It is very interesting to see what Wenger did in history on the handles with invisible rivets. There are many types and different attaching methods. Then from 2004 the company did go with a special design on the ergonomics, this had been thought about before, but not possible for production. But it is this we see from 2004 and up. The company entered the marked with Evolution and up until today this has been a success. 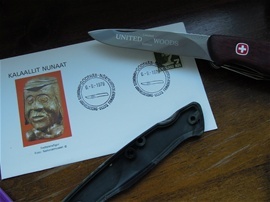 In 2010 we see EvoWood and then in 2013 the United Woods Set, if we look back in history we see that this company made special handles all the way. Even Victorinox used Wenger inventions on the scales. 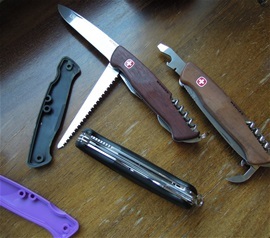 On the picture you see three Ranger 55 models, one with black plastic scales and the Oceania Ranger with Jarrah wood. The right knife is RangerWood 55 with Walnut. The use of Realtree Ap Blaze, AP Snow and Hardwoods is another of the innovative evolution of scale designs. In Wenger history we see knives that got icons and other scale details, sportsmen knives that can relate to a persons interests. Not only with the functions but also the scale design. 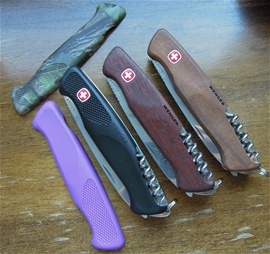 On Wenger knives with "hunting" functions may have for example AP Blaze, this relates to a persons interest so it serve more than the function of good grip.